Dudley, a Catahoula leopard puppy, is a survivor. Burned twice in multiple locations, his ears were discolored and scarred. His muzzle was hairless. His missing upper and lower lips exposed his teeth, and his lashless eyelids drooped. Dudley at the shelter, left, and after recovering with his new family. Dudley and another dog had wandered to a farmer’s property in Lenoir County, N.C., and both were taken to an animal shelter in Kinston. 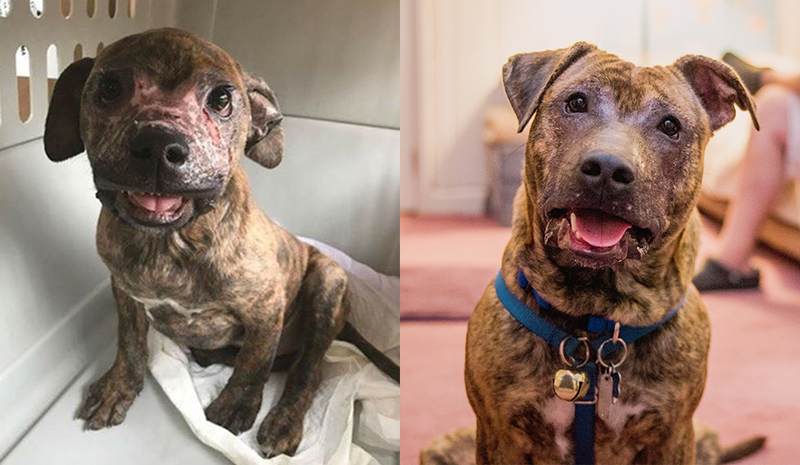 Though what happened to Dudley is unclear, his long-term needs for veterinarian care were undeniable – and that just considered his physical wounds. Bruce Pait, a Duke Energy transmission employee in Raleigh, received a call from his friends at Pawfect Match Rescue and Rehabilitation in nearby Holly Springs. The rescue team asked Pait and his girlfriend, Shannon Adkins, if they could take care of Dudley. Having fostered more than 250 dogs since 2011, the couple was up for the challenge. Dudley went to about eight veterinarian visits in 10 weeks, undergoing several nose-to-toes exams, seeing an eye specialist and getting his throat and larynx checked. He also needed antibiotics, burn cream applied to his face three times a day and eye drops inserted nightly. Soon Dudley would be ready for adoption. Pait brought Dudley to a Petco adoption event near Raleigh to interact with people and other animals, but he wasn’t available for adoption. 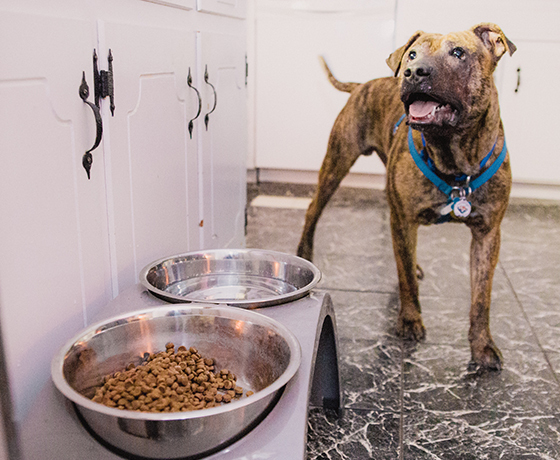 Because Dudley’s story received news coverage, Pawfect Match had already found him a home – a woman who worked for a veterinarian and had three other rescue dogs. The typically shy pup leaped from behind some tables and caught the attention of Patty Stetson and her daughter, Maria. The Stetsons' dog had died three months earlier, and the house felt empty. The Stetsons went to the event not to adopt but to help turn their sadness into joy by cuddling with True, Cookie and other puppies. “We wondered how we would feel when we encountered another dog,” Patty Stetson said. The Stetsons needed to know if their connection to Dudley was real. They spent the rest of the afternoon visiting animal shelters, petting and playing with dozens of dogs. if he can go outside. On any given day, the 60-pounder runs laps around the yard like Olympian Usain Bolt, vaulting through the air over invisible hurdles. He digs, sometimes finding a vine and pulling it. He prances on his 2-mile walk at the park. People shout his name with enthusiasm, inciting a million facial licks at full speed. Inside, he jumps on the furniture like a child in a bounce house. Later, he reclines for a summer nap in his favorite chair. Dudley has every reason to be fearful of people, aggressive or withdrawn. But with his larynx healed, he now barks with thunderous veracity. He is alive, and he is home. Choose happiness. Though he had a horrific experience and needs daily eye drops and moisturizer to protect his delicate skin, Dudley chooses to put his wag on. Friendship is forever. When the farmer found Dudley, he was with another dog, Amanda. Patty Stetson found Amanda at the Kinston animal shelter and reunited Dudley with her. Amanda is living with a foster family in Virginia and is available for adoption. Click Lucky Dog Rescue for more information. It takes a village. The world is filled with compassionate people who want to make a difference. 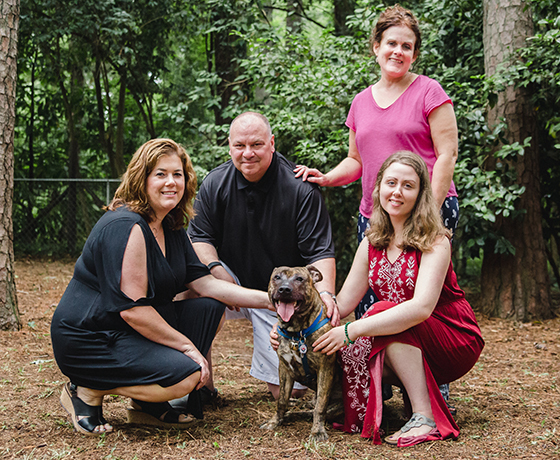 Pawfect Match Rescue and Rehabilitation, Lenoir County SPCA, veterinary hospitals, media, Bruce Pait and Shannon Adkins, the Stetsons and people who sent cards and well wishes to Dudley all contributed to his rescue. “Our experience with Dudley gives us hope and encouragement when the rescue days get tough,” Pait said.